This Garlic Rosemary Prime Rib Roast is a show stopping meal that’s perfect for the holidays. One of my all time favorite episodes of Parks and Recreation is when Donna and Tom take one day to “Treat Yo Self.” During this annual celebration, they indulge in all the things they’d normally say no to–cashmere sweaters, weekday mimosas, full body massages, the most expensive package at the spa. They call it the best day of the year, and it’s tough to argue with them. Sometimes it’s fun to say yes, and go all out out. 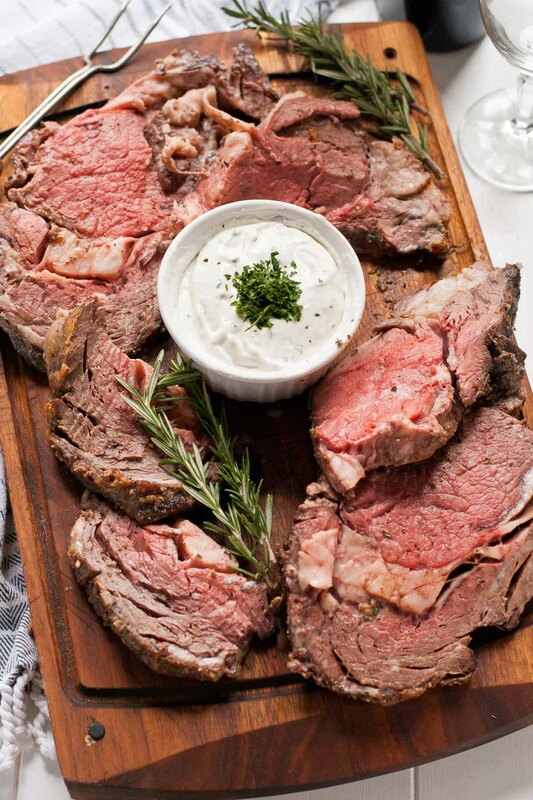 If ever you needed an excuse to go all out, this Garlic Rosemary Prime Rib Roast is it. Until just recently, most of my exposure to prime rib was the kind that sits under heat lamps at sub-par buffets. Needless to say, I was never very impressed. Then, on a recent date night to Kraft House No. 5 (Columbus friends, you must go there!! ), my husband ordered the prime rib. What arrived a few minutes later was a thick slab of tender, perfectly pink beef swimming in its own juices. They served the prime rib along with a creamy horseradish sauce that I could’ve drank like a shot. It was one of the most incredible meals of my life. I decided I had to try and recreate the dish at home, and I am so glad I did. As it turns out, making prime rib is a lot easier than I suspected. 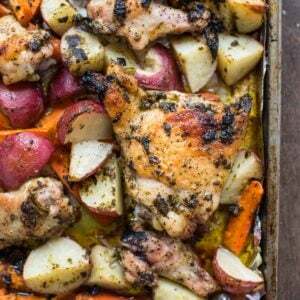 This one is coated in a flavorful mixture of Kosher salt, rosemary, oregano, garlic, and pepper. Like turkey, it’s best to cook roast first at a high temperature to get an irresistible crust, then lower the temperature to ensure the roast cooks evenly and remains tender in the center. This roast is truly a treat. 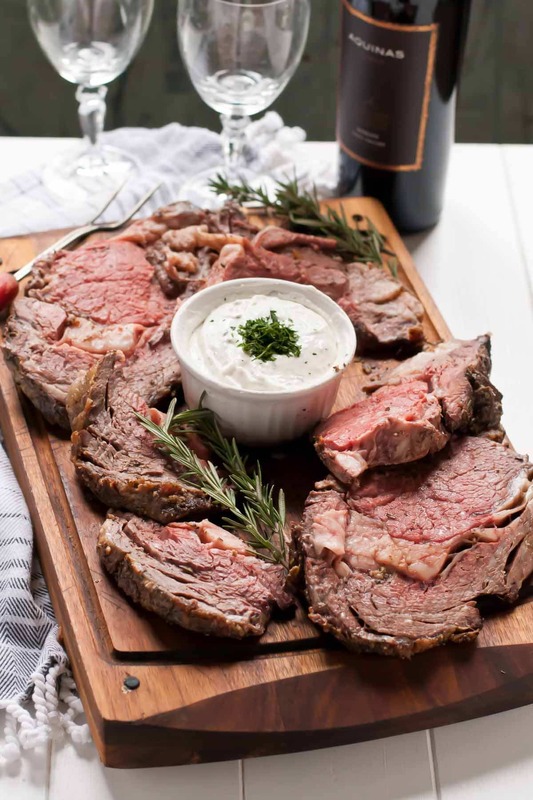 Prime rib roasts have the perfect amount of marbling, making them a great choice for flavorful meat without a lot of work. Your guests will fight over the crispy, heavily seasoned edges while enjoying the rich, juicy centers. 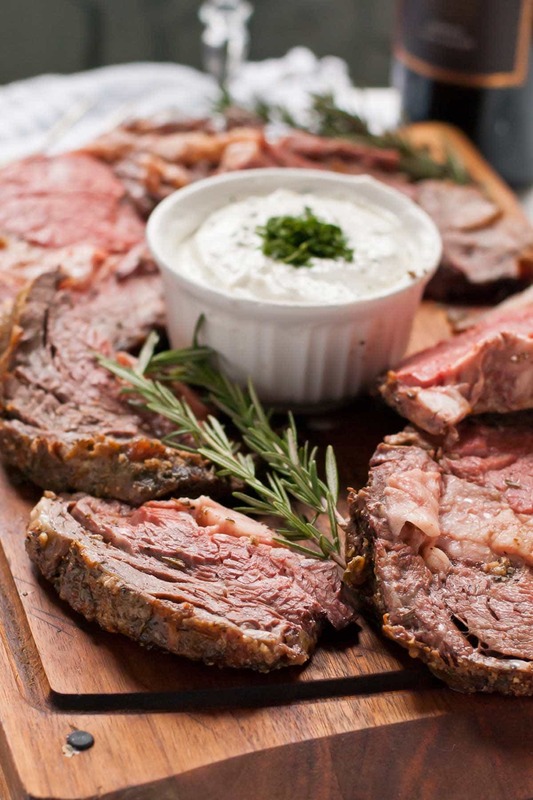 The simple horseradish sauce cuts the heaviness of the meat, and adds just the right amount of sinus-clearing heat. I know beef is probably already your weeknight casserole go-to, but it can also be a stunning centerpiece for your holiday table. This gorgeous ribeye made with Ohio Beef is the best excuse to treat yo self and your guests this Christmas. Each 3 ounce serving is packed with 25 grams of protein and 10 essential nutrients, making it the gift that keeps on giving. Ohio beef farmers take great care of their animals all season long, in rain or shine, sickness or health, snow or sun. This short video of the Rittenhouses gives you a little peek into the great dedication and care Ohio farmers have for their animal’s well being, especially as we head into these cold weather months. To learn more about animal care and find more great ideas for treating yourself with Ohio beef this season, visit their website or follow along on Facebook, Twitter, and YouTube! Place the roast in a roasting pan. Cut a few shallow slits on the non-fatty side of the roast. In a small bowl, combine the rosemary, oregano, olive oil, and garlic. Rub this mixture on all sides of the roast, pressing it into the slits on the top. Allow the roast to sit and marinate at room temperature for 30 minutes to 1 hour. Preheat the oven to 450 degrees. Sprinkle the salt and pepper all over the roast, putting an extra thick layer on the fatty side. Turn the roast so the fatty side is facing up then place in the preheated oven for 25 minutes. Turn the oven down to 325 degrees and continue to cook for 60-90 minutes or until center registers 130 degrees for a medium rare center. Tent the roast and let it rest for 20-30 minutes before slicing. Scrape off any excess salt on the fatty side. 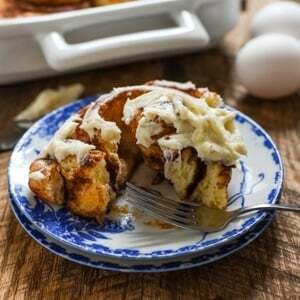 Slice and serve with the horseradish sauce. Mix together sour cream, horseradish, vinegar, and parsley. Season to taste with salt and pepper. Serve with the beef. The sauce and leftover roast beef make a great sandwich the next day! This post was developed in partnership with the wonderful folks at Ohio Beef. As always, all opinions are my own. Still hungry for more beef? Check out these other holiday show stoppers from my friends! How would I go about making an au jus out of pan drippings? Also, do you know if this would work by replacing the olive oil with softened butter? Have seen that in a few recipes and not sure which provides tastier results. Thanks so much and looking for to making my first prime rib guided by your recipe! 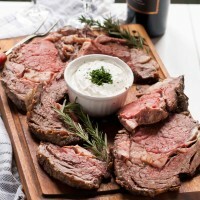 I like this au jus recipe: https://www.thespruceeats.com/au-jus-recipe-for-prime-rib-996073. And I definitely think you could use softened butter if you prefer. I would recommend using unsalted so the crust doesn’t get too salty. Hope you enjoy! I made this for Xmas….it was damn good, used the leftover horseradish cream on chilli. This comment made my day. Thanks for letting me know. I’m so glad you enjoyed it! I have a bone in prime rib. How would that work out using these exact directions? This was an amazing recipe for the prime rib roast. It was extremely easy to make and my family loved it. This was the first time I’ve ever made prime rib roast and even the sauce was delicious I felt as though I wanted to lick my plate at the end of my meal five stars. This makes me so incredibly happy. Thank you for coming back to share! Is the roast in the oven covered or not? Hi Bettyanne. I leave it uncovered! I assume you use white balsamic to not discolor the white sauce. I don’t cook often and not sure where I’d get that or when I’d use it again, so any advice on a substitute? You could definitely use regular balsamic or even try something like white wine vinegar or apple cider vinegar, though I might cut down on the amount. Apple cider vinegar has many other household uses as well if you have trouble using it up! Care and well-being of – and dedication for – their animals … does this extend into the transport and slaughter? Serious question. Thanks in advance. This is definitely a serious question! I cannot speak for every single farmer, but I have visited and worked with several farmers here in Ohio, and I can tell you that dedication certainly extends to transportation and slaughter. I highly recommend finding a local farmer and having the conversation with them yourself! Many welcome the opportunity to share more, and even invite visitors. Different farmers work with different processing facilities, but you can also talk directly to the processor to find out how they handle slaughter. Sounds delicious! Just a question…this is a 5lb roast that serves 6? So each serving would be a about 3/4 of a pound? I made this for Christmas and it was wonderful!!!! The sauce was good, also!! I would make it again!! ;) Thanks 4 the recipie!! That’s wonderful! I’m so glad you enjoyed it! Thank you so much!!! It turned out perfect. I can’t find where the chives get added… assuming with all the other sauce ingredients? Excited to give it a try! Hi Courtney. I made your recipe for New Years Day. Absolutely DELICIOUS! I sliced under the fat cap without releasing the ends. Added my herbs under and all over and roaster 425 degrees for the 25 minutes and 325 degrees for exactly 1 hour and 23 minutes. Rested 5 minutes and did the temperature check…PERFECT medium rare. Thank you! Mom said I outdid myself on this dinner. She’s 88.